Turkish President Recep Tayyip Erdogan tried to extort Israel to withdraw its support, and threatened to end the process of normalization unless it does so. It is worth noting that Turkey strongly supports statehood for the Palestinians but not for their own Kurdish population. Hypocrisy abounds in the international community, but that should surprise no one. Iraqi Kurds were a key partner for the U.S. coalition that toppled Saddam Hussein's regime and has staved off further sectarian tensions in that country. One thing is clear: if the United States continues to neglect its "friends" and allies in the region -- those on the front line in the fight against ISIS -- the damage to its credibility will only increase. Nor are there any limits to the hypocrisy of those university students and faculty who demonstrate so loudly for Palestinian statehood, but ignore or oppose the Kurds. When is the last time you read about a demonstration in favor of the Kurds on a university campus? The answer is never. No one who supports statehood for the Palestinians can morally oppose Kurdish independence. But they do, because it is double-standard hypocrisy, and not morality, that frames the debate over the Israeli-Palestinian conflict. More than 90% of Iraq's Kurdish population have now voted for independence from Iraq. While the referendum is not binding, it reflects the will of a minority group that has a long history of persecution and statelessness. The independence referendum is an important step toward remedying a historic injustice inflicted on the Kurdish population in the aftermath of the First World War. Yet, while millions took to the streets to celebrate, it is clear that the challenges of moving forward toward establishing an independent Kurdistan are only just beginning. Already, Iraqi Prime Minister Haider al-Abadi, has said: "we will impose the rule of Iraq in all of the areas of the KRG, with the strength of the constitution." 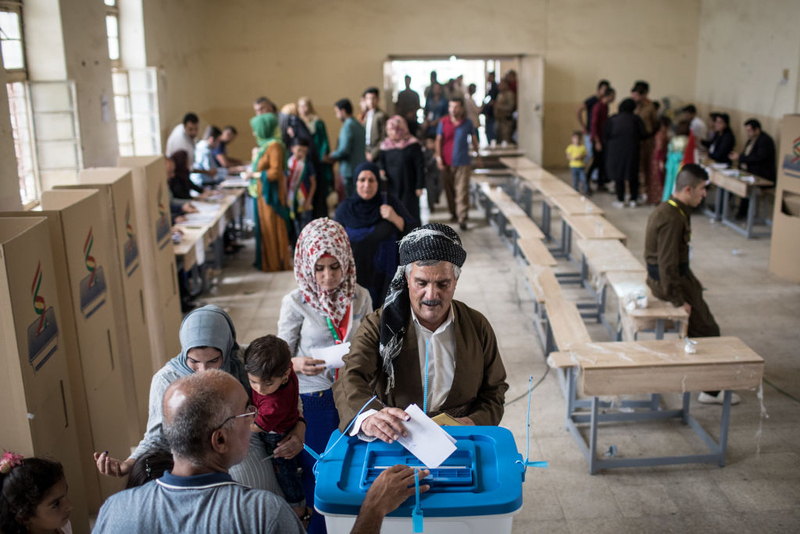 Meanwhile, other Iraqi lawmakers have called for the prosecution of Kurdish representatives who organized the referendum -- singling out Kurdistan Regional Government (KRG) President Masoud Barzani, specifically. While Israel immediately supported the Kurdish bid for independence, Turkish President Recep Tayyip Erdogan tried to extort Israel to withdraw its support, and threatened to end the process of normalization unless it does so. It is worth noting that Turkey strongly supports statehood for the Palestinians but not for their own Kurdish population. The Palestinian leadership, which is seeking statehood for its people, also opposes statehood for the Kurds. Hypocrisy abounds in the international community, but that should surprise no one. The case for Palestinian statehood is at least as compelling as the case for Kurdish statehood, but you would not know that by the way so many countries support Palestinian statehood but not Kurdish statehood. The reason for this disparity has little to do with the merits of their respective cases and much to do with the countries from which they seek independence. The reason, then, for this double standard is that few countries want to oppose Turkey, Iraq, Iran and Syria; many of these same countries are perfectly willing to demonize the nation-state of the Jewish people. Here is the comparative case for the Kurds and the Palestinians. First, some historical context. In the aftermath of WWI, the allied forces signed a treaty to reshape the Middle East from the remnants of the fallen Ottoman Empire. The 1920 Treaty of Sevres set out parameters for a unified Kurdish state, albeit under British control. However, the Kurdish state was never implemented, owing to Turkish opposition and its victory in the Turkish War of Independence, whereby swaths of land intended for the Kurds became part of the modern Turkish state. As a result, the Kurdish region was split between Turkey, Syria, Iraq and Iran, and the Kurds were dispersed around northern Iraq, southeast Turkey and parts of Iran and Syria. Although today no one knows its exact population size, it is estimated that there are around 30 million Kurds living in these areas. In contrast to the Palestinian people, who adhere to the same traditions and practices as their Arab neighbors, and speak the same language, Kurds have their own language (although different groups speak different dialects) and subscribe to their own culture, dress code and holidays. While the history and genealogy of Palestinians is intertwined with that of their Arab neighbors (Jordan's population is approximately 50% Palestinian), the Kurds have largely kept separate from their host-states, constantly aspiring for political and national autonomy. Over the years, there have been countless protests and uprisings by Kurdish populations against their host-states. Some rulers have used brute force to crack down on dissent. Consider Turkey, for example, where the "Kurdish issue" influences domestic and foreign policy more than any other matter. Suffering from what some historians refer to as "the Sevres Syndrome" -- paranoia stemming from the allies' attempt to carve up parts of the former Ottoman Empire for a Kurdish state – President Erdogan has subjected the country's Kurdish population to terror and tyranny, and arrested Kurds who are caught speaking their native language. But perhaps no group has had it worse than the Kurds of Iraq, who now total 5 million -- approximately 10-15% of Iraq's total population. Under the Baathist regime in the 1970s, the Kurds were subject to 'ethnic cleansing." Under the rule of Saddam Hussein, they were sent to concentration camps, exposed to chemical weapons and many were summarily executed. It is estimated that approximately 100,000 Kurds were killed at the hands of the Baathist regime. So "restitution" is an entirely appropriate factor to consider -- although certainly not the only one -- in supporting the establishment of an independent Kurdistan in northern Iraq. In contrast, the Palestinians have suffered far fewer deaths at the hands of Israel (and Jordan), yet many within the international community cite Palestinian deaths as a justification for Palestinian statehood. Why the double standard? "the state as a person of international law should possess the following qualifications: (a) a permanent population; (b) a defined territory; (c) government; and (d) capacity to enter into relations with the other states." The KRG meets these criteria, as least as well as do the Palestinians. Moreover, the autonomous Kurdish region in northern Iraq -- the closest it has come to having its own state -- has thrived and maintained relative peace and order against the backdrop of a weak, ineffectual Iraqi government and a brutal civil war. As such, it represents a semblance of stability in a region comprised of bloody violence, destruction and failed states. That the bid for independence will distract from the broader effort to defeat ISIS – which is being fought largely by Kurdish Peshmerga forces. These arguments are not compelling. Iraq is a failed state that has been plagued by civil war for the last 14 years, and the Kurdish population in its north represent the only real stability in that country, while also assuming the largest military role in combatting ISIS' occupation of Iraqi territory. There is also nothing to suggest that an independent Kurdistan would cease its cooperation with the anti-ISIS coalition. If anything, the stakes in maintaining its newfound sovereignty would be higher. Additionally, Iraqi Kurds were a key partner for the U.S. coalition that toppled Saddam Hussein's regime and has staved off further sectarian tensions in that country. One thing is clear: if the United States continues to neglect its "friends" and allies in the region -- those on the front line in the fight against ISIS -- the damage to its credibility will only increase. "The Kurds are a nation, same as Arabs, French and English. But this referendum is not an innocent step. The only country behind them is Israel. Once Israel is behind them, then from my point of view, we have to be careful." Clearly, there are no limits to the Palestinian Authority's hypocrisy. Nor are there any limits to the hypocrisy of those university students and faculty who demonstrate so loudly for Palestinian statehood, but ignore or oppose the Kurds. When is the last time you read about a demonstration in favor of the Kurds on a university campus? The answer is never. No one who supports statehood for the Palestinians can morally oppose Kurdish independence. But they do, because it is double-standard hypocrisy, and not morality, that frames the debate over the Israeli-Palestinian conflict. Alan M. Dershowitz, Felix Frankfurter Professor of Law, Emeritus, at Harvard Law School and author of, "Trumped Up! How Criminalization of Political Differences Endangers Democracy," which is now available. Hmmm, what an idea: instead of demonstrating against the BDS and its anti-Israel alt-leftism by proclaiming support for Israel, let there be combined pro-Israel + pro-Kurdistan rallies, with flags of both, and the people supporting each other. Thank you for this revealing presentation. America's position is somewhat puzzling but will hopefully moderate if the new administration is able to break free from entrenched ME policy. Great article, Mr. Dershowitz. It is another ridiculous state of International Law. Nations convene to devise strong laws for nationhood. Then they convene to play G-d by condemning the formation of nationhood. I would think that any large, ethnic group that has all the features of nationhood would be a boon to business globally eventually. Also, nationhood allows for organizational cohesion and order in a very chaotic region. Economies would form helping to "carry the load", so to speak, in meeting budgetary realities for fighting poverty, building military installations that provide added security for that region, and eventually helping provide assistance in natural disasters in the region. I can only wonder at these hypocrisies we carry so ludicrously on our sleeves. Humans assigned to LEAD are digging in their heels just to promote their own power....or, they enjoy the provocation of saying "NO"! The Kurds have fought long and hard against Isis. They have spilt much blood to liberate Iraq. They are the only democracy in the Middle East. They should not have to live under the oppression of Iraq and Turkey. They have been under armed and under protected by the West. Saddam Hussein dropped chemical weapons on them. Who would trust Iraq or Turkey? They would like nothing better than to annihilate the Kurds, and only an idiot doesn't get that. 1) Kurds are a distinct ethnic cultural group of people. "Palestinians" are not, and are in fact a fusion of several ethnic groups such as Turks, Iranians, Kurds, Afghans, Sudanese, Egyptians, Berbers, North Africans, Black Africans, Germans, Italians, Greeks, Bosnians and Albanians. Not only is there not any distinct "Palestinian" ethnicity, it would be a mistake referring to them as "Arabs" as well, they aren't even a homogenous group of people in any cultural, historical, lingual or ethnic sense. "Palestinians" belong to at least one dozen different ethnic groups hailing from North Africa, Middle East, Asia, Central Asia, Southern and Central Europe and the Balkans. 2) Kurds are the natives of Kurdistan. Kurds have populated Kurdistan for at least centuries - if not thousands of years. "Palestinians" are neither "Palestinians" nor the natives of Israel. Most "Palestinians" arrived in Israel/British Mandate of Palestine/Turkish Province of Syria primarily between the 1880s and the 1940s. That's hardly ancient history. European colonialist and imperialist history in North and South America, North Africa, Black Africa, Middle East, India, China, Hong Kong, Macao, Indo-China, Japan, Australia and New Zealand, is OLDER than "Palestinian" history in Israel. 3) There is a Kurdish language. There isn't a "Palestinian" language. 4) Kurdistan is a Kurdish word. "Palestine" is a ROMAN/LATIN name, and has thusly, no possible connection to the Arab or Islamic culture and civilization. 5) The Kurdish identity has existed for thousands of years. The "Palestinian" identity is an artificial political identity which was invented in the 1960s by the Arab states, as a political tool, to rewrite 4000 years of Jewish history in Israel, in order to dislodge the Jewish natives from Israel and to Arabize Israel. What the Arab states could not achieve militarily on the battlefield against Israel, the Arab states hoped they could achieve politically, to engage the "world community" and force Israel to commit suicide, give up its ancient Jewish homeland, and serve it on a silver plate to the Arab Moslem empire. 6) The Kurdish identity is unique and distinct. The "Palestinian" identity is solely based on destroying Israel as a Jewish state and killing the Jews, and dislodging the Jewish natives from Israel. Ethnically, racially, culturally, linguistically, historically and religiously, there is no difference between "Palestinian" Arabs on one hand, and Saudi, Iraqi, Kuwaiti, Jordanian, Syrian, Lebanese and Egyptian Arabs on the other hand. 7) Kurds are mentioned in historical documents and sources. By contrast, not a single ancient civilization, not a single ancient written record, not a single archaeological excavation, not a single page in a single history book, not a single brick or stone or piece of dust, makes any reference of any kind, to any "Palestinian" Arab or non-Arab people, nation, 'culture or civilization. 8) The Kurds merely want their ancient homeland back. By contrast the "Palestinians" are stealing the Jewish people's ancient homeland, and the "Palestinians" are de facto being the Arab Moslem empire's demographic Trojan Horse inside Israel to overwhelm the Jews demographically. Fortunately, Jewish demographics and fertility are strong, and Arabs have no realistic chance of dislodging the Jewish natives from Israel. The Jews of Israel are here to stay, and the Kurds of Kurdistan are here to stay as well. Look what I wrote three years ago, on October 23, 2014. The Kurds have a right to independence. Their lack of it until now is an unjust and tragic accident of history. The borders of most of the Arab countries east of the Mediterranean were delineated in the period following WWI, on the ruins of the Ottoman Empire. The borders were fixed on the basis of British and French interests and the ties those two countries had formed with local groups. Two non-Muslim groups were granted independence: The Jews were given Britain's pledge – in the form of The Balfour Declaration – that it would help establish a National Home for them, and France granted the Christians dwelling north of Israel the country of Lebanon, as separate from Syria. The Zionist movement was active and visible in the political corridors of Britain, while the French empathized with the fears the Lebanese Christians held of becoming a minority in a country with a Muslim majority. One ethnic group, the Kurds, was left without a state, and was, instead, divided among four countries: Iraq, Syria, Turkey and Iran. The main reason for this was that the Kurds had no organization representing them on the European scene and no country that interceded for them. The Kurds were the really major sacrificial lamb of the 1916 Sykes-Picot Agreement. In every one of the nations to which they were appended, they are hated, denied their rights, pushed to the sidelines and persecuted. Hundreds of thousands of them have been murdered in struggles against the governments of the countries to which they were parceled out. Israel helped the Kurds in northern Iraq in the early 1970's. The Kurd's problematic status led to their becoming fearless and imbued with a strong sense of national consciousness, so that, for the most part, they are able to overcome tribal loyalties and divisiveness in their midst. A feeling of being under siege and the need to fight constantly for their existence and basic rights has forced them to draft anyone who is able to hold a weapon That is how many Kurdish women were allowed to join the fighting force, in contrast to the Middle Eastern tribal tradition of relegating women to the task of caring for their homes and families. The Kurd's situation has worsened radically since Islamic State appeared on the scene in Iraq and Syria several months ago. This cruel terror organization attacks and eliminates anyone who is not a Sunni Muslim, as we all witnessed with regard to the terrible fate that befell the Yazidi tribe: murder, masses dead of starvation, the sale of women as slaves in the market and forced conversion to Islam. Muslim Sunni communities fare no better unless they join Islamic State and their men become members of the organization's gang of murderers. Most of the Kurds are Sunni Muslims, but they have not joined "Islamic State", so they must fight on to keep from being annihilated. The city of Kobane has been at the center of this battle for a month now, and all the sides involved are playing a dirty game with the lives of the Kurds dwelling there. Assad positively enjoys seeing them flee to Turkey, the Turks hate them and would not help them until a few days ago, the West is busy with the Ebola virus and with trying to save Baghdad and Iraq – and only the Iraqi and Turkish Kurds wish to go to Kobane with their weapons in order to come to the aid of their besieged brethren. The world in general and the countries in proximity to the Kurds in particular have proven to them once again – if any of them was in need of additional proof – that only the Kurds can help the Kurds. Only Kurdish strength, a Kurdish military force and a Kurdish state can guarantee that the Kurdish people will be able to live a normal life, the kind of life a nation that has its own state can lead. This is first and foremost an ethical position, because every nation that has achieved independence for itself is morally bound to stand with the Turks so that they, too, are able to live as a free people in the land they have inhabited for thousands of years. They are not immigrants, they are not invaders, and they will not go anywhere else. Meetings of exiled Kurds have been taking place lately to come up with ideas for moving towards some level of self government for the Kurds, while looming in the background there is the Turkish threat to squash any trace of Kurdish independence in what was once the land of Syria. The Kurds in Syria, however, are fully aware of their Iraqi brothers who have had a government, parliament, army, communications and economic system of their own in an independent region for twenty years, with minimal ties to Iraq. Kurdish refugees are travelling worldwide trying to elicit well-deserved financial and public support for their plight. The world – its nations, organizations and citizens – simply must support them. The world must tell the Kurds: It is time for your redemption. It is time to announce the death of the artificial countries of Syria and Iraq, created in the Sykes-Picot Agreement; it is time to re-arrange the Middle East in accordance with the interests of its own peoples, not those of Britain and France. Colonialism disappeared seventy years ago, and the time has come to erase that colonialist heritage – that is, the borders of Syria and Iraq. What happened to Yugoslavia, Czechoslovakia and the USSR is the model for redesigning the Middle East. All three came apart on ethnic lines and most are now developing, tranquil and legitimate modern states. Ukraine is doing the same thing right now. This is a natural process in a world where ethnic origins are of great significance to most of the public, where groups are willing to wage war with one another due to differences in language, culture and tradition. As far as this is concerned, the Middle East is no different from Europe. Here, too, loyalty to traditional frameworks – tribe, people, religion and sect – are stronger than loyalty to a modern state. That is why the post WWI nations, especially Syria and Iraq, failed in the main goal of a state: to find a place in the hearts of their citizens, to create an Iraqi and Syrian national ethos, to exchange the traditional loyalty and identity with that of modern statehood. That is why the Kurds are still defined as Kurds – by their neighbors as well as by themselves – and not as Syrians, Iraqis, Turks or Iranians. The West and particularly Israel, must take a moral stance – which also happens to be a realistic stance – and support, both in word and deed, the legitimate rights of the Kurds to full independence and to a state like all the other peoples of the world. That is the only way to free them from decades of suffering brought on by long-extinct colonial interests. All those nations so eager to recognize a "Palestinian people", a fictitious "people" whose existence was unknown before the 1970's, a "people" without its own language, culture, ethnicity or territory – let's hear them for the Kurds. The Kurds are a real nation, much more deserving of recognition and rights than the virtual Palestinian "people". Turkey will not be pleased with international recognition of Kurdish rights. The Turks massacre the Kurds mercilessly; in the last thirty years alone, the Turkish army murdered tens of thousands of Kurds in Turkey and Iraq. The world – from an ethical point of view - must tell the Turks that "enough is enough, the time has come for you to recognize the legitimate rights of the persecuted and oppressed group for whose suffering you bear a good deal of responsibility." The Arab government of Iraq will make some noises about not wanting a Kurdish state taking oil and territory from Iraq. But if and when a Kurdish state is established, a good many Iraqi Arabs will breathe a sigh of relief. Assad's heart will also rejoice once the world liberates him from the Kurds - and the Iranians, who have a small number of Kurds in their country, will begin to worry that their Kurds will also want to separate from the country that rules them only because of the British. If the Iranian Kurds continue their efforts to have an independent state and begin to fight for it, they might inspire other minorities who live in Iran to demand ethnic rights and even the legitimate right to become a separate entity. This scenario is just as possible in Iran as it is in Iraq, Syria and Turkey and might lead to an Iranian civil war and collapse, another possible positive outcome of a Kurdish state in Syria. No less a positive outcome would be felt in dealing with Islamic State. The Kurds are proving that they are just about the only force in the region that is steadfastly battling Islamic State. Other countries – Turkey and Iran – have not rushed to send their soldiers to the battlefield, and might never do so. The West and several Arab nations are limiting their involvement to air power, which cannot destroy Islamic State. If ground forces that can search each house, basement, apartment and ditch do not join the war, Islamic State will not be defeated. In that case, Islamic State will probably be around for a good number of years and the world will accept its existence as a fact. Is the acceptance of the right of the Kurds to independence as a fact less probable than that of Islamic State? In a situation where the Middle East is collapsing, it is imperative to begin the process of building alternatives to its failed states. A Kurdish state could well be a new and well ordered beginning for the modern history of the Middle East, with a better chance of succeeding than the one that followed WWI and failed in most instances. A Kurdish state will be the "coming thing" in the region and open the Middle East "Spring of Nations", 166 years after a similar "Spring" began in Europe. This is an excellent comment. I would like to add that I witnessed the Kurds welcoming displaced and persecuted Christians in Kirkuk as well as Irbil. In Irbil, new hotels and shopping areas were being built and the city streets were so clean and unlike most cities in Iraq, trees and shrubs adorned the streets. You mentioned the Sykes Picot Accord which drew national boundaries. The worst part of the Accord is that there were no understanding of the Islamic groups in the region. Had the French and English understood just a little of the animosities between the Sunni and Shia, the national boundaries would have been much different. My superiors in Baghdad became upset when I stated that both Iraq and Syria should be reshaped to reflect the make up of the population. Iraq alone should have been divided into three separate nations. Unlike Belgium where neither the Walloons nor the Flemish would give up Brussels, thus, keeping the country more or less unified, Damascus could be discarded by the Sunnis making Mosul as their capital and Basra for the Shias. Syria is very similar in that the country has been divided into three regions and for any lasting peace, should be divided. I still think that peace would have a chance. If UN, the superpowers, and the world community at large, stand by and let the Kurds be slaughtered, as they have been doing for over a century, but this time around collectively by the three occupiers (Iraq, Iran, and Turkey) who collectively can annihilate the Kurds with their Western-supplied air power, then we will lose all meaning to humanity, justice, and civilization. Until yesterday, almost every nation worldwide was commending the Kurds for their bravery, values, modesty, and as defenders of the civilized world, and then overnight they are told, "you got your reward (our blessing) now don't go asking for candy too. We will call you when we need [to use] you again!" I have always thought that given the major errors of fixing borders in the middle east after the 1st world war and the tribal make up of the people which has brought so much misery, a Kurdish state makes sense. If Iraq, Turkey and Iran could be persuaded to give up some of their present territory for an independent kurdish nation it could be the catalyst to bring peace throughout the troubled region. Of course there will have to be an agreement to share any oil wealth. This is covered in my book "The world at a crossroads"
Although this article was about Kurdish independence, which I believe should be given to the Kurds, who are a stable and we'll-adjusted people, it also referred to a Palestinian state. This should never happen. These are a very different people, hateful and murderous. Their only goal is to annihilate all Jews and take Israel for its own. Such a people should never have a state, especially as it would quickly be taken over by ISIS or its ilk and create an intolerable situation for everybody in its surroundings. I think Dershowitz should be more careful in his comparisons, especially as there was never a "Palestinian" people and there is no such thing now. They might call themselves Palestinians but that was just a name given to this group by Arafat, who was the major influence in creating the horror that now exists among the so-called "Palestinians". I agree with Mr Dershowitz completely. The Kurds have been marginalized for too long, this ethnic group, who have held on to their own language, customs and identity, have been treated badly, their people spread over Iraq, Iran and Turkey. They deserve to be unified and to be able to run their own affairs in their own independent state - 100 years too late. Let's see justice done! Sadly the British and the French botched up the carve-up of the Ottoman Empire after WW1. 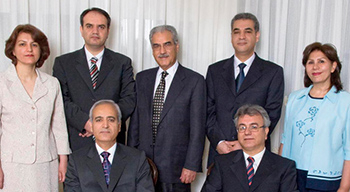 The Kurds remind me of another upstart group that had the temerity to challenge a great power. Let's see, that was on July 4,1776 I believe. Professor Dershowitz has written a compelling and insightful piece on the situation in which Kurds have been imprisoned for a long time. There is every reason to consider carefully the merits of their wish for freedom. Likewise, there are many reasons to expect that barricades will be placed before them, once again. What is happening in Kirkuk is similar to what is taking place in Barcelona. Let the world listen, and judge with wisdom and compassion. Am in total agreement. They have been great allies during our stay. I am SAIS 1970, and know the ground, from school and then Naval Intelligence. About time Kurds have their own State, which MUST be carved out of Iraq, Turkey and Iran. The only position of conscience in relation to the Kurds Is to support their independence. They defended our civilisation against barbarism whilst far too many were siding with the enemy. They have more than earned the right to govern themselves, free from fatally oppressive meddling by others. Kurdistan now! Not only in Iraq but in all of their ancestral land. The Kurds where there before the start of history millennias before any Arab came out of Arabia of Turks out of Central Asia. The thieves, colonizers British and French created states for their own benefit and sliced and diced the brave Kurds between Turkey, Syria, Iraq and Iran. Kurds declared citizen of 4 countries created by Western thieves. They were chemically attacked by Saddam in the Iraqi part of Kurdistan because they are not Arabs. They are killed, jailed for speaking the ancient Kurdish language, their national language. Turkey destroyed their villages. Iran Jails Kurds for any reason they find useful that day in Iran. Time to let the Kurds have their Kurdistan from Turkey to Iran. Beside Kurds rejoicing many Christians, Yazidis... will breathe a sigh of relief in Kurdistan safe and protected by Kurdistan like all religions are protected in Israel. The USA lost the best of it's sons to spread democracy in the middle east with zero success so far. Time to change that with Kurdistan now! Then there will be at least two democracies in the Middle east: Israel and Kurdistan.